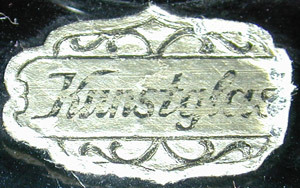 Cheese dish with Kunstglas label. 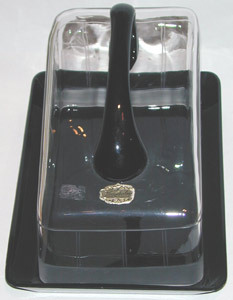 Topic: Cheese dish with Kunstglas label. Any suggestions on maker and date please? By the look of it, German or Dutch from the 1930s - a standard pressed cheese bell which is not entitled to a label that says "art gass". After browsing through some glass it would appear that this label was used as a generic identifier of Art Glass rather than being the name of a company. The same label can be found on a range of items from the 20's & 30's in particular. I thought the comment that it does not deserve the label was a little harsh. Art I thought was in the eye of the beholder and obviously the maker considered it to be art glass and with the obvious art deco connection it would be difficult to dismiss it as being a form of art glass. The black is self coloured, deep purple/aubergine colour with light through it. There is some light wear scratching under the dish but none that I can see inside the bowl - so it has spent its life in the 'best' cupboard. The design is wheel cut into the cover but not with the greatest care and attention, the lower 1.5cm has an acid frosted border. 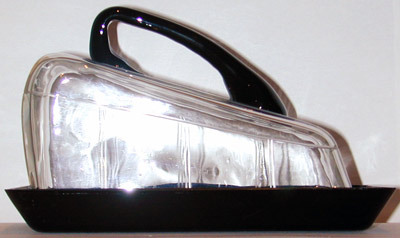 The top edge of the dish is ground and lightly polished. I could accept 50's from condition and 30's from style but the quality is an enigma, attention to detail but not a high level of skill. The fit of the top on to the base is very good with virtually no wiggle and no wobble. Dutch or German seems likely, as I found it here, but who might it be? Re: Cheese dish with Kunstglas label. The very dark glass which is actually dark purple is quite typical for some Belgian factories. The handle is indicative, since this is actually 'the handle for a waterjug'. Almost all the 'official' Dutch products were made with a 'knob' rather than a handle. I don't see anything which will lead do an identification from documentation, but suspect somewhere in the east of Belgium. As noted in the book 'Verre de Boom' they had lost the technique for pressed glass during the war and were 'forced' to improvise some of their designs, and that's rather what it reminds me of. Just my humble....very humble opinion!